Our Advent Calendar, without messages to our children from the Advent Elf. I started to write a blog a couple of weeks ago about the arrival of the Advent Season but as I later proofed it, I realized that this year Advent is seeming more like the season of Lent instead. I have found us besieged with many tests and trials distracting me from the peace and joy of this season. We are all experiencing that our contentious election is not over but has continued. War in Syria only got worse in Aleppo and has been brought to us live on our TV screens, despite the fact that war is truly not a spectator sport. Strong differences of opinions are rampant and agitating us all on the internet and facebook and threats by our president to retaliate against the Russians for their alleged internet hacks have had a most unsettling effect on many of us. Today was "the icing on the cake" when I received what I thought was another "free sample" of cosmetic cream, that wasn't free at all but rather a scam where I was being charged $95 a bottle, not once, but twice! I yelled and screamed that I would contact my lawyer and call my credit card to cancel payment as their service representative challenged me regarding signing myself up for "such a deal" and refusing to allow me to send it back for a full refund! I won in the end, but this isn't preparation for the peace and love of Christmas, but rather a season of political and world unrest, where scams, nastiness and contempt abound! 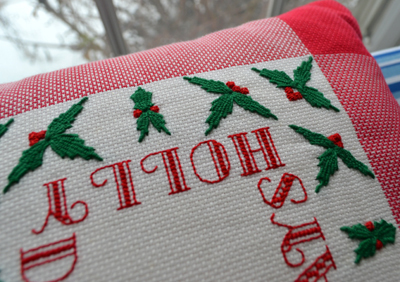 My special stitched pillow reminding us of the Holly Days of Advent. God doesn't give up, however, and neither do I! Christmas is right around the corner and it will be here, whether our hearts are prepared or not. At my age I no longer welcome the cold of winter, but will be delighted to have Christmas to warm my heart and hopefully everyone will put down their political differences to celebrate whatever traditions you ascribe to. It seems that the holiday season has a special day for people of all faiths. I, for one, am NOT going to miss the traditional celebration that ties and unites our family together, and will take comfort in the message of peace and love! Our family has taken much care and time to establish our traditions that we hold to every year. We have intentionally taken time away from the concerns of the world to celebrate our religious traditions and I am so glad now that we still come together to celebrate, no matter the circumstances that surround us! 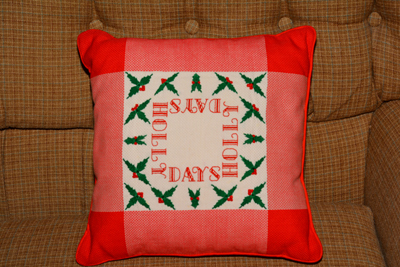 This pillow was made a long time ago, when I had much time for each stitch! 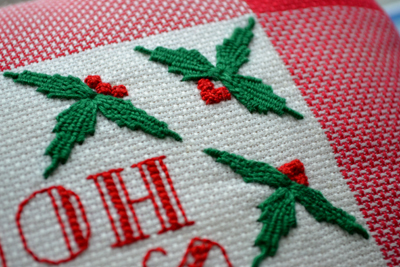 It is done with in cross stitch, straight stitch and a special wrapped stitch. Our traditions beckon us to return to what gives meaning to our lives and helps us focus on what is most important, the love of family and friends! Our celebration focuses on the birth of the Christ Child and Christmas Eve Mass will be its highlight. We start with the singing of Christmas carols and then a candle-lit procession in our beautifully decorated church, complete with a large creche and Christmas greenery. Christmas Day will follow with an exchange of gifts that represent Christ's gift of love for us and for each other and then onto a big Christmas dinner with all of us gathered. No matter the disturbance of this year's continued political fighting, the lack of acceptance of the new administration, warring around the world, and evil tricks by those trying to take advantage, I will have my heart and spirit warmed by Christ's love and the love of my family as well, all much needed to face the months ahead in our cold and snowy Vermont weather! We will pray for our world and its unrest, and hibernate to keep warm. 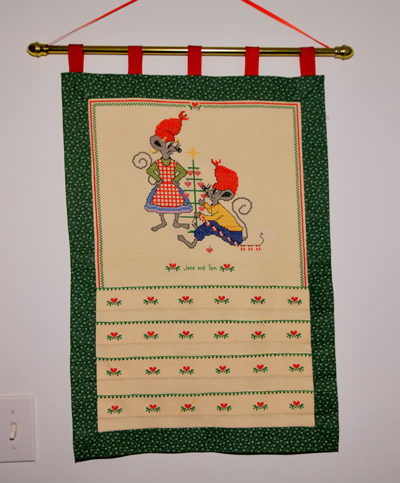 For me it will bring stitching on unfinished quilts each day. So here we come 2017! At Little House, we will not live in fear but rather in renewed hope and a willingness to face new challenges! I am praying that all Americans will renew their faith during this holiday season and be more ready to courageously embrace whatever changes this next year brings. I will re-dedicate myself to pray for new visions as to what I can do each day to make the world around me better. I may do only small things but doing them with great love was the goal of Mother Teresa and has become my mission as well. 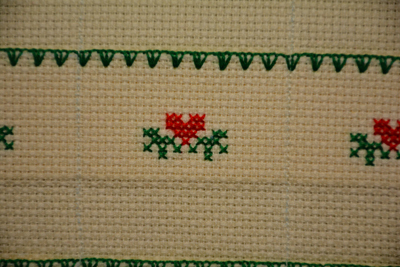 A heart is stitched on each day's pocket to remind us to take time for love. I wish all my readers a beautiful Holly Season, and a New Year filled with God's blessings.